In the olden days, the typical procedure of buying a new car battery entailed a visit to the local battery shop. You evaluate different brand options, take their recommendation, haggle on the chosen battery's price and try getting the most $$$ for your old (exchange) battery. Unfortunately, that process takes up too much time and might pose some inconvenience too, if your car is immobile due to a flat battery. Plus, the price you end up with depends greatly on your negotiation skills. After 4 years of hard usage, my Jeep's Amaron Harvest battery was showing the signs of death. At a recent service visit, my service advisor confirmed that the cells are awfully weak. 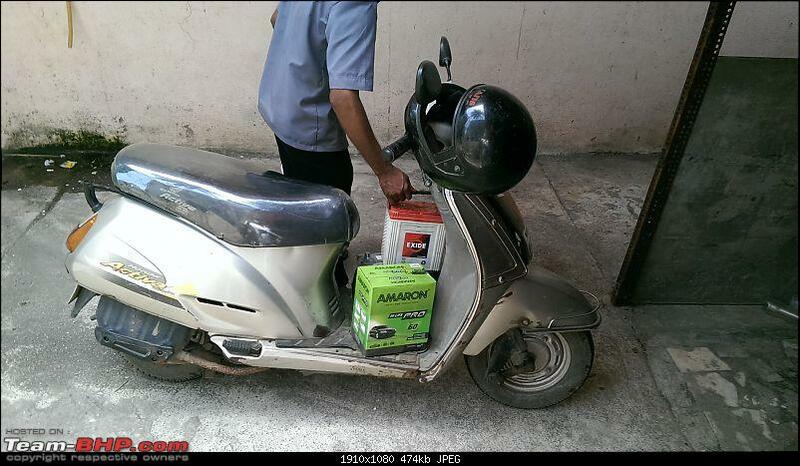 Home delivery & installation of batteries. Super fast! Their car-wise battery search helped me complete the order in 5 minutes. Got a call within 30 minutes to schedule an appointment. The battery technician was willing to get to my place in 3 hours with the new battery. I asked him to come in on Sunday instead; he was here 15 minutes before the decided time. Good pricing. 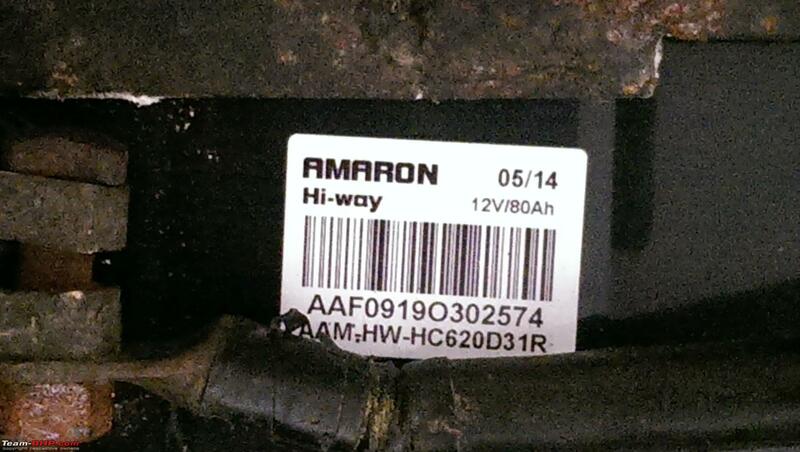 The Amaron battery I bought was cheaper by Rs. 550 compared to the local shop. Batterybhai lists both prices...with & without exchange of your old battery. 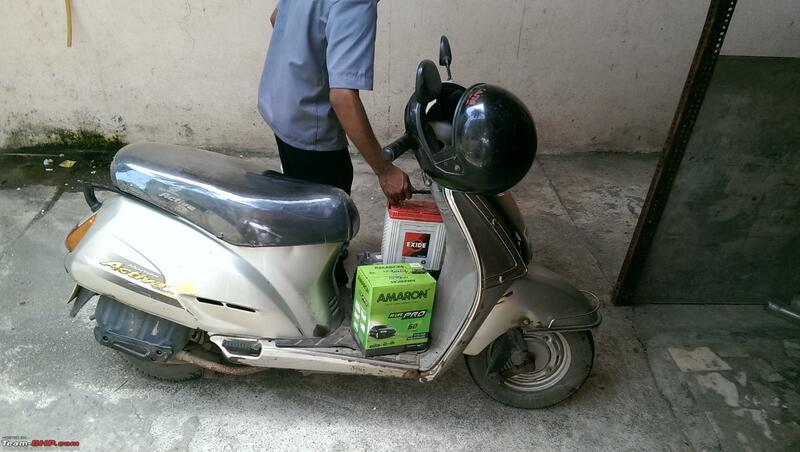 Hassle-free experience: The technician arrived with all necessary tools, volt gauge, warranty card & bill. I didn't have to ask for a thing. Be sure to shop around online. 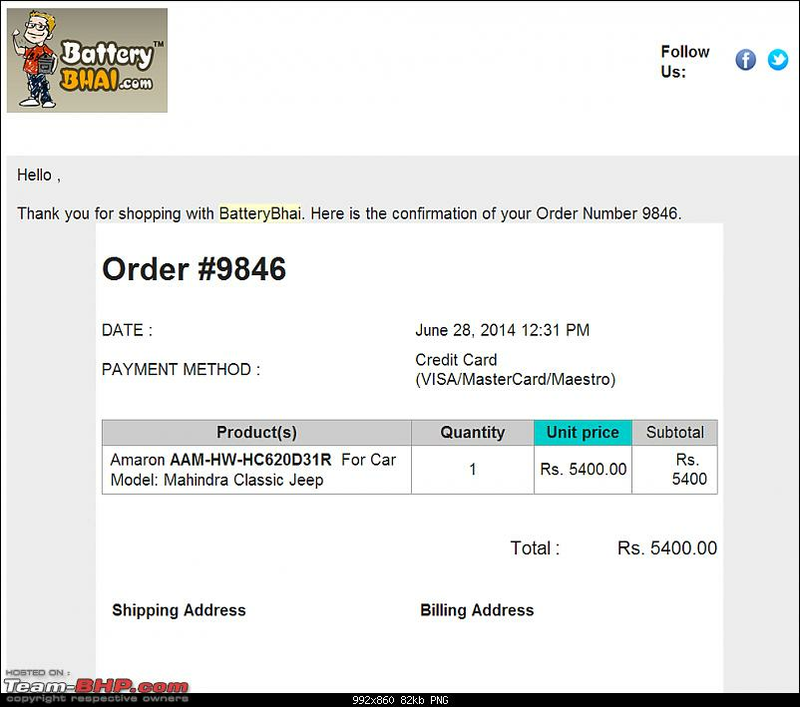 After I bought my battery, I found the same model on www.carbatteryexpert.com for 600 bucks lesser!! 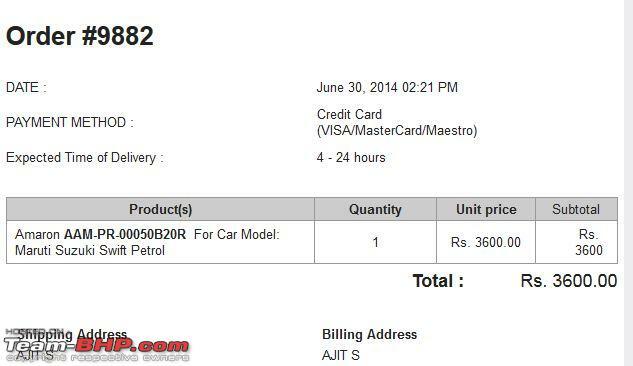 However, for a Civic, batterybhai has a lower price. Guess it varies from car to car, but be sure to compare prices before buying. www.bookmybattery.com (Bangalore only) is even cheaper than these two. Good only for plug & play installs (OEM battery sizes) and not custom work (like in my Jeep). The battery I was using before was a size larger than the one I just bought. The local shop would've altered my current bracket to fit the new battery's size. The batterybhai technician wasn't carrying any tools / equipment for bracketing work. Bikers need to look elsewhere. http://www.batterywale.com/ carries a wide range of two-wheeler batteries. Pricing: Competitive, but certainly not the cheapest option (check comment above). Last edited by GTO : 2nd July 2014 at 17:07. Thread moved from the Assembly Line to the Team-BHP Directory. Looks like they have signed up a large number of brick-n-mortar battery shops/dealers. 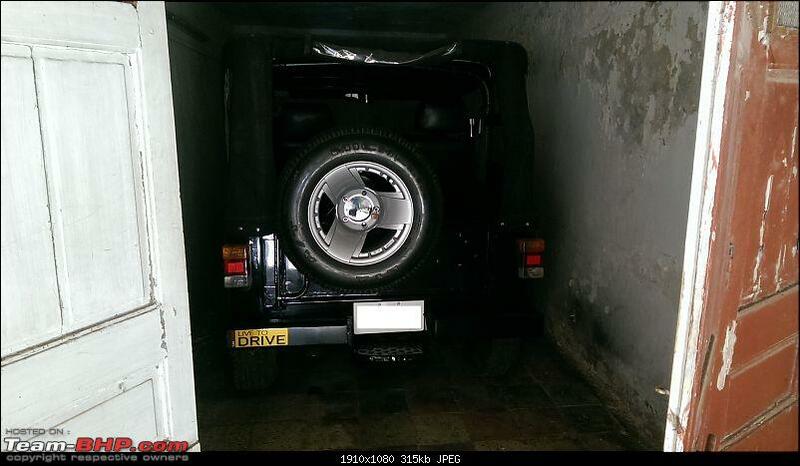 And wow, GTO, you have a nice cozy parking place for the Jeep. Good thing the Jeep doesn't have doors huh? I used their services to replace a dead battery on my Chevy Beat. I had no issues with them and I wouldn't mind recommending them to others. 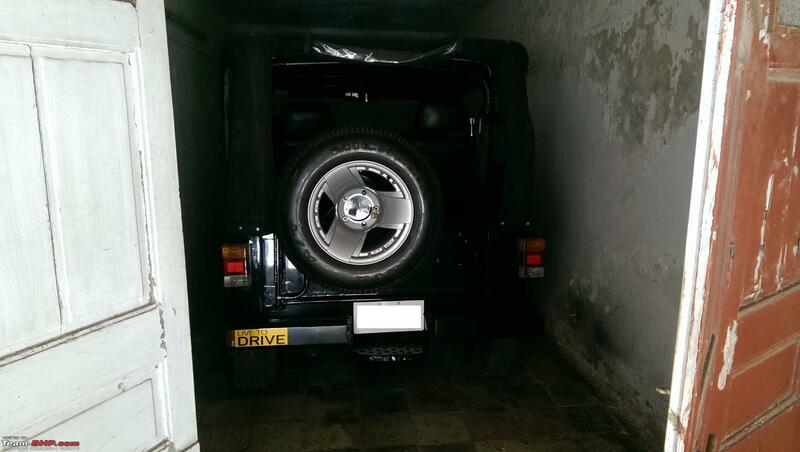 The convenience of having something replaced in your parking space is unbeatable. Changed my battery couple of months ago and bought a new one from this site. 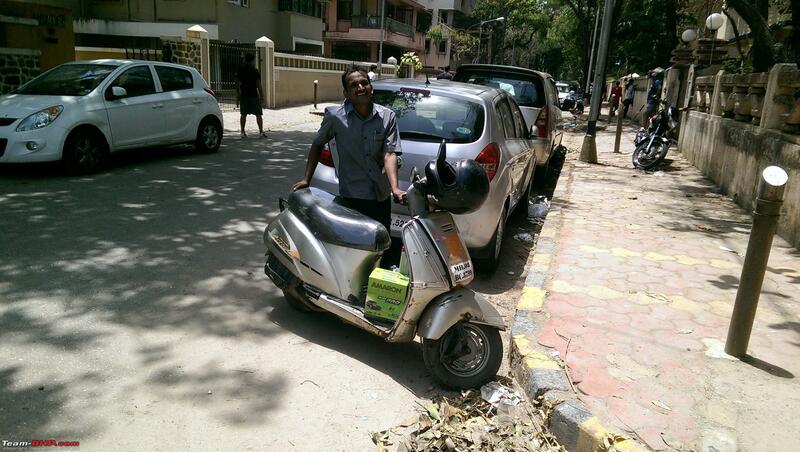 Yups, pretty prompt service and yes, this is exactly how even my car battery was delivered! I think you meant "Amaron"
I recently had a similar experience. It was more or less like a online purchase. My City went dead all of a sudden, umpteen calls to dealer was only prolonging things. 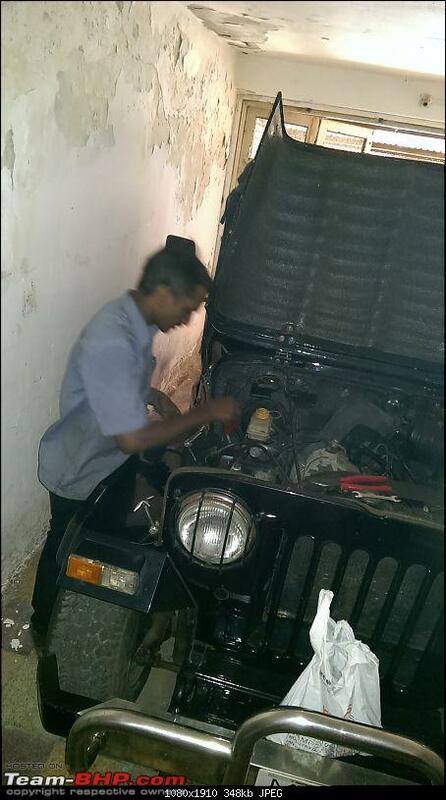 After some shouts, they raised a case with Exide and in turn they directed a local dealer to help me. In one hour, the battery was replaced and the payment was done in my parking area with the portable swipe machine. How sweet. Heard of this batterybhai but it didn't strike me to call/order with them since I was in a urgency to get my car back on road. Yep, I've used batterybhai in Bangalore back in 2012 if I remember right (when my genius of a cleaner left the reading lamp on and I did not notice until a week later). For safety I ordered COD and it was delivered and installed within 24 hrs. The price was way lower than quoted by local guys and he even offered to take the old battery for a price. Just spent half an hour analyzing what battery I should be buying for my Fiesta 1.6S and where I should be buying it and then I open up T-Bhp and spot this thread in the Hot Threads. Thanks GTO for starting this up. I am now going to book one online. Just got this quote from the 3 websites: Car battery is the cheapest with it charging 500rs less than bookmybattery and 100rs less than batterybhai. The local shop here quoted 4500 including my old battery for the same. Last edited by Avinash_R : 3rd July 2014 at 11:33. AFter 5 Years running on Stock Battery on my Swift Petrol, the battery completely gave up. Called few shops in Secunderabad and had the best price of Rs. 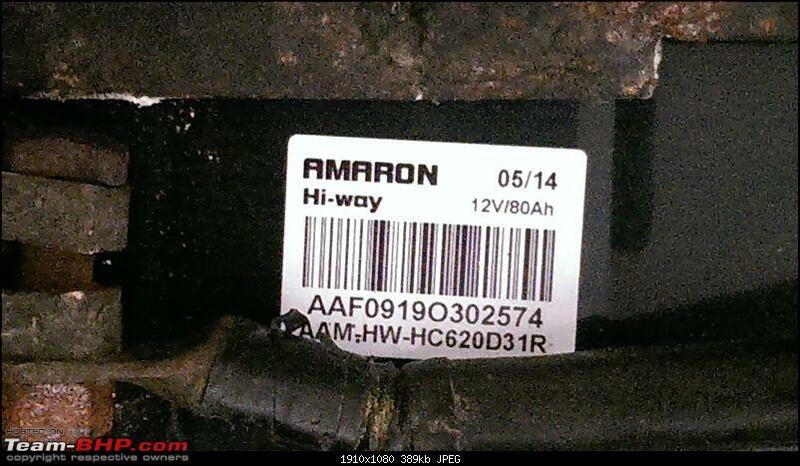 4000(with old battery) for Amaron 50B20R. 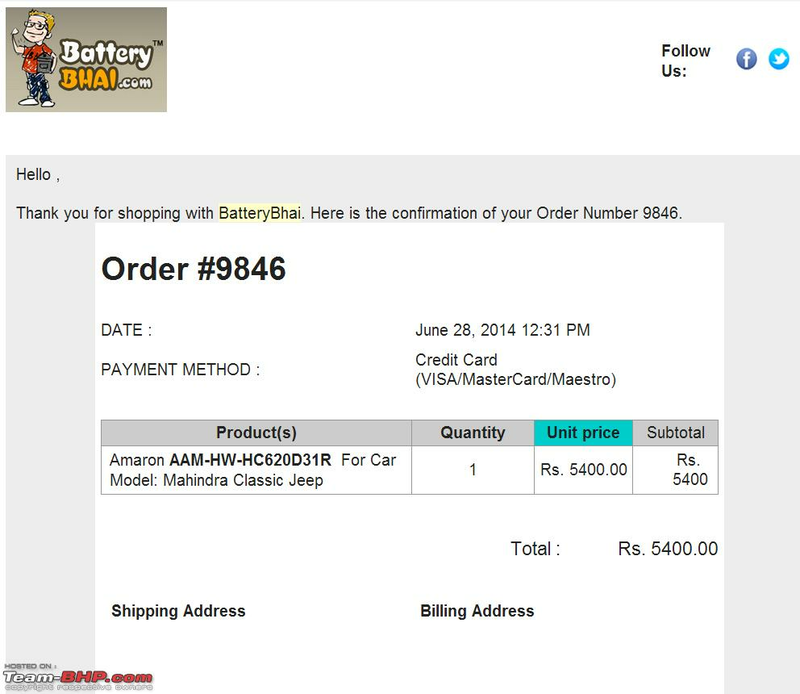 Looked up online and ended up buying from Batterybhai.com for Rs. 3600 (with old battery). The service is exemplary. Within 30Mts of placing the order Online I had received call from the local installer for my time. Was fixed the same day at 7.30PM. The order was placed around 2.30PM. Local installer was also good, telling me do's and don't. Totally will recommend online purchase. Last edited by ajitsank : 3rd July 2014 at 13:51. Great. They have service in Gurgaon too will use them. You cant forget the name Battery Bhai. My Scorpio is 3 years and 5 months old now. A warning sign may come any day. Will replace it with Amaron of course once I need to. The worst battery I have experienced was this Tata Battery in the Toyota Liva. Last edited by desertfox : 3rd July 2014 at 18:16. Can one order a battery of a different AH rating to the old one? With the local fellow, normally he does not make an issue out of such differences (probably absorbs it in his pricing). Provided it fits the battery housing and the charger circuit can take it. I guess if I replace the OE 65 AH Amron in my Scorpio VLX with an 80 AH it should be withing the tolerence if it fits in snugly and flush. What does the pro-rata mean ?? The Battery on my Honda City ZX needed replacement and hence thought of trying the option of purchasing car battery online. 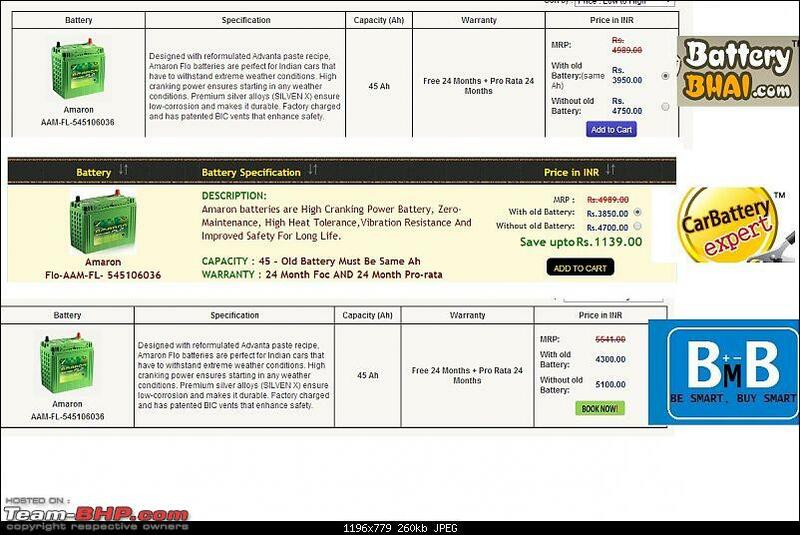 Based on information given in this thread, compared quotes from www.batterybhai.com and www.carbatteryexpert.com. 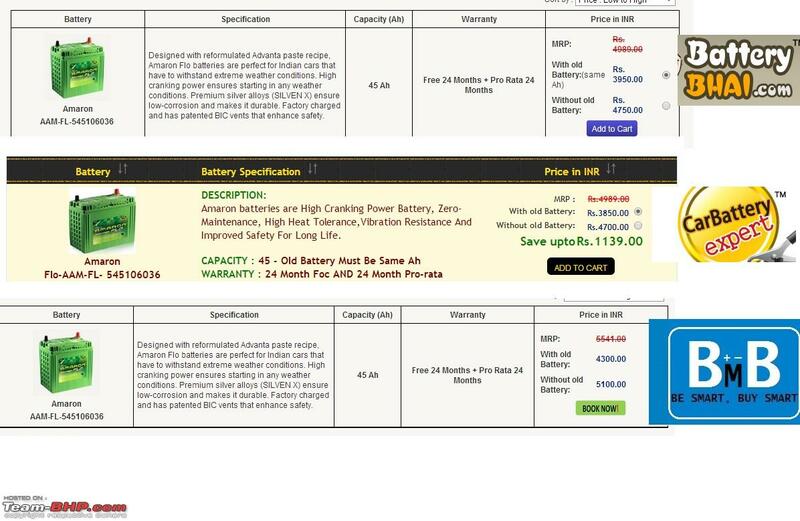 The prices for almost all the batteries for Honda City ZX on www.carbtteryexpert.com are cheaper by about 100 bucks than www.batterybhai.com and hence ended up ordering Amaron 42B20L from www.carbatteryexpert.com. I was extremely pleased with the quick response from www.carbatteryexpert.com team. Even though it was a Sunday, as soon as I placed a order, my phone rang asking me about when I would like the battery delivered and informing me that a local installer would call me in a short while to confirm time and place for installation. After this call, in another 20 minutes, the local installer called and time of installation was fixed after one hour and indeed the fellow showed up at my place on said time. The battery was installed in about 15 minutes, all receipts, warranty card signed and after making payment the fellow was on its way. The only negative that I can think of is payment though cash only for Pune City. However they do accept credit cards in Mumbai. Over all a big thumbs up for www.carbatteryexpert.com.